The Starks' Blog: Who Taught Him That?! Can someone tell me when BB learned how to sit by himself? I seem to have missed it. Seriously. 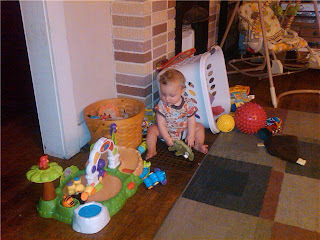 I went to the kitchen the other night to check on dinner and when I returned to the living room, he was sitting by himself and pulling toys out of a basket. It kinda freaked me out.